Performance issues began to arise for an ABB auxiliary relay used in several non-safety related control schemes. As is typical in the industry, the component is no longer manufactured raising an issue of obsolescence. Other relays are available which would serve as an adequate replacement, but refurbishment is preferred since the characteristics and foot print match the application and minimize replacement work. The issue with the relay was sticking on pick-up. The first step was to take temperature measurements at a variety of locations within the relay to determine if there were any signs of a localized heating effect. A check was also made of the DC coil resistance and pick up voltage. This was followed by a systematic disassembly and a check of the air gap dimension. Contacts were evaluated for pitting or other signs of degradation. As the coil ages, the magnet wire insulation becomes more glassy and shorting between turns begins. This essentially leads to a reduction in the number of turns, therefore effecting coil operation. Often this process begins toward the middle to start of the coil winding, since this area has a greater strain on the turn. The key checks were air gap dimension, coil integrity, contact status and signs of heating. The coil was unwound and the turns counted. The magnet wire gauge and insulation class were determined and the coil rewound. The contacts were cleaned and resurfaced. 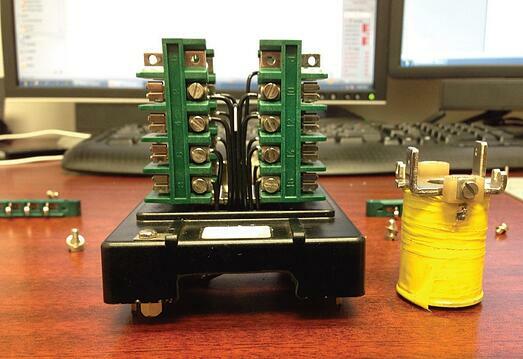 The DC resistance and the pickup voltage were measured and found to be within specification. 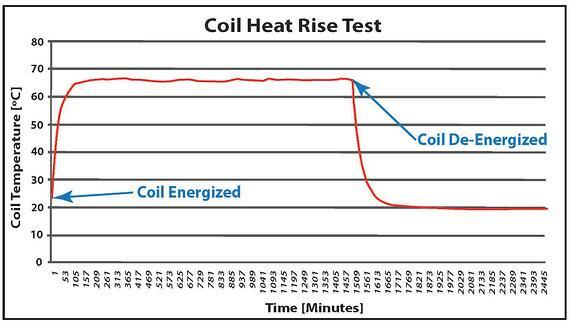 Finally, the coil temperature rise was measured by resistance. The DC coil resistance, pickup voltage and temperature rise were all indicators that the refurbishment was successful in establishing like for like relay meeting form, fit and function.